Anticorrosive polyurethane coating compositions were compounded using novel zinc-free nanosized phosphates: aluminum ammonium phosphates (AAP) or calcium aluminum ammonium phosphates (CAAP). For comparison, a nanosized strontium phosphate (SP), AAP/SP mixtures, and a microsized zinc phosphate (ZP) were tested. Paints containing ammonium-modified phosphates exhibited similar or a slightly higher viscosity than systems with SP or ZP. Nevertheless, coatings with the AAP or CAAP reached significantly better gloss and adhesion to a steel substrate as well as a slightly higher hardness. Results of a salt spray test showed that anticorrosive properties of the coatings containing AAP/SP mixtures were markedly better in relation to the systems containing solely AAP, CAAP, SP, or ZP. 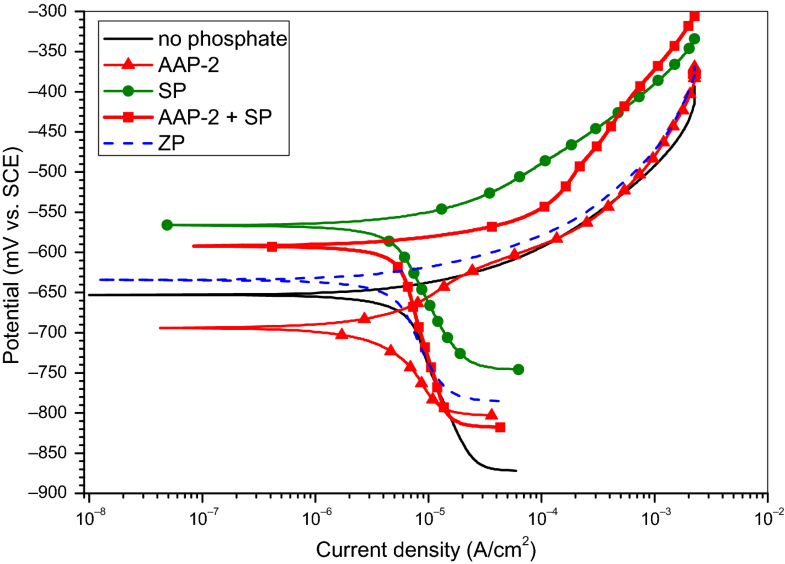 Electrochemical tests revealed the best barrier/anticorrosive features for AAP (electrochemical impedance spectroscopy and potentiodynamic polarization) or SP and CAAP (a novel electrochemical noise technique). Since application of red lead and zinc chromate (VI) in anticorrosive coating materials has been prohibited, zinc phosphates belong to the most effective protective fillers/pigments used in 1 K and 2 K paints for steel substrates. However, due to lately revealed negative influence of these fillers on aquatic life, various zinc phosphates, pyrophosphates, and phosphosilicates modified with Li,1 Na,2 Mg,3 Al,3–14 K,15 Ca,3,6,16 Fe,4,12,14 Sr,6,17–19 and/or Mo4,6,14,20 were developed and investigated in solventborne, low-VOC, and water-thinnable coating compositions. Additionally, many types of zinc-free derivatives of phosphorus-based acids and ammonium and/or Al,5,7–9,15,16 Mg,18 Ca,3,10,13,16 Cr, Mn,16 Sr,5,10,13,17,19,21 Ba,15,17 Pb12 were investigated as corrosion inhibitors in coating systems. Anticorrosive efficiency of the mentioned fillers (in relation to the zinc phosphates) is a result of a type of polymeric binder, auxiliary fillers addition as well as investigation method, e.g., electrochemical measurements of fillers aqueous extracts or filled coatings, accelerated tests in salt spray, condensation or Kesternich chambers, immersion tests, outdoor exposition. Generally, it could be claimed that various phosphates containing Zn and Al,4,5,13,14 Sr,19 Fe,4,12,14 or Ca6 belong to the most attractive corrosion inhibiting additives. A positive influence of Ca cations on aluminum zinc phosphate efficacy was described in the literature.3 In the case of Zn-free compounds, aluminum phosphates16,22 and these additionally modified with Sr13,21 exhibit relatively high protective features. Interestingly, polyurethane coatings filled with nanosized aluminum phosphates (Ø255–270 nm) or submicrosized aluminum ammonium phosphates (500–990 nm) reached similar or better anticorrosive properties than samples with a microsized zinc aluminum phosphate (< 63 μm)7–9 and an aluminum phosphate (< 4 μm). It is noteworthy that the mentioned nanofillers improved gloss of the coatings7; that optical feature is crucial for compositions applied as primer-less top-coating systems. In the case of anticorrosive epoxy systems (containing bisphenol-based resins1,2,4,5,14,16,21), the cured coatings must be additionally covered by a UV-resistant paint due to their chalking during exterior exposure. The paints were prepared as follows: A phosphate filler, TiO2, and Aspolit F40 were dispersed (25°C, 25 min) in a part of hydroxyacrylic resin containing the auxiliary additives and solvent in the pearl mill (Klaxon, UK). Then, the talc and wollastonite were incorporated and the system was milled for 20 min. The paste was mixed with the rest of the hydroxyacrylic component using the laboratory dissolver (1250 rpm, 1 h) (VMA Getzmann, Germany), filtered (190 μm), and mixed with the aliphatic diisocyanate hardener using a laboratory mixer and stored at RT for 20 min before application. The paint components, phosphate fillers content, pigment volume concentration (PVC), and critical pigment volume concentration (CPVC) values are specified in Table 1. The paints were applied with a brush (according to the Polish Standard PN-C-81514:1979) and leveled with a spiral film applicator (150 μm) onto a steel substrate. The steel panels (Q-Panels, Q-Lab Europe, England) with the dimensions of 76 × 152 mm (for adhesion and electrochemical impedance spectroscopy (EIS) tests) and 102 × 152 mm (salt spray test) were used. Two-layer samples were prepared by applying two layers of coating compositions with 24-h painting interval. The paints were also applied onto glass plates (for hardness measurements) using a gap applicator (300 μm). The coatings were cured at room temperature for 14 days before testing. The specific gravity of the phosphate fillers was measured using Ultrapyc 1200e helium autopycnometer (Quantachrome Inst., USA). The oil absorption for the mentioned phosphates was measured according to the Polish standard PN-EN ISO 787-5. The particle size of the fillers was analyzed using the laser scanning microscope VK-9700 (Keyence, USA). The conductivity of phosphate aqueous dispersions (5 wt%) was tested using the Elmetron CC-505 conductometer (Elmetron, Poland). The pH of aqueous suspensions (10 wt%) of the phosphate fillers was measured by means of Elmetron CP-401 pH meter. Chemical composition of the nanofillers was determined by colorimetric vanadium–molybdenum method (P2O5 content; Spekol 11, Carl Zeiss, Germany), spectrometric ICP-AES method (aluminum, strontium, zinc, and calcium content; Optima 5300 DV, PerkinElmer, USA) as well as using the ion selective electrode Orion 11–35 (ammonium content). where q0 and q are charge density values for the steel substrates tested in 3.5 wt% NaCl aqueous solution and 0.1 wt% suspension of a phosphate filler in the 3.5 wt% NaCl aqueous solution, respectively. Steel corrosion products formed during electrochemical noise tests as well as powdered phosphate fillers were investigated using Fourier-transform infrared spectroscopy with attenuated total reflectance (ATR) accessories (Nexus FTIR; Thermo Nicolet, USA). The X-ray analysis of the steel corrosion products was carried out using Empyrean PANalytical diffractometer (Cu Kα, 10–70° 2θ) equipped with the HighScore + Philips software and ICDD PDF-4 + 2015 database. where i0 and i are corrosion current density values registered for the steel substrate tested in 3.5 wt% NaCl aqueous solution and an aqueous extract of phosphate filler in the 3.5 wt% NaCl aqueous solution, respectively. High shear viscosity tests (I.C.I. cone-plate system; Research Equipment, UK) were performed for ready-to-use liquid coating compositions (i.e., after 20 min since incorporation of the hardener). Gloss at 85° (PN-EN ISO 2813, three measurements for each sample; IQ20/60/85 glossmeter, Rhopoint Inst., UK), König pendulum hardness (PN-EN ISO 1522, three measurements for each sample; AWS-5, Dozafil, Poland) were evaluated on cured paints. Pull-off adhesion of coatings (PN-EN ISO 4624:2004, six measurements for each composition; 510-T hydraulic apparatus, Elcometer, UK) was measured before and after 250 h of the samples immersion in a periodically air-saturated NaCl aqueous solution (3.5 wt%). The thickness of cured films was measured with the electronic film gauge Byko-test 8500 (BYK-Gardner, Germany) according to PN-EN ISO 2808. EIS tests were carried out with coated panels (two-layer coatings with a thickness of 128–147 μm, three samples of each composition) after 0, 100, and 250 h of their immersion in the periodically air-saturated NaCl aqueous solution (3.5 wt%). A three-electrode vertical glass cell (with 14.5 cm2 surface sample area) equipped with a graphite counter electrode and a saturated calomel reference electrode was used inside the Faraday cage. The impedance data (0.001–10,000 Hz, 100 mV amplitude of sinusoidal voltage vs. OCP) were collected using EIS300 software with FAS2 femtostat (Gamry) and analyzed using the electric circuit model presented in Fig. 1 (Ru—uncompensated solution resistance, Rp—pore resistance, Cc—coating capacitance24). The pore resistance and coating capacitance parameters were calculated in respect to the coating thickness and presented as relative Rp (i.e., Rpr, Ω/μm) and relative Cc (Ccr, F/μm) with standard deviations. The salt spray test was carried out according to PN-EN ISO 9227 in CorrosionBox 400 (Co.fo.me.gra., Italy) using a NaCl aqueous solution (concentration of 50 ± 5 g/l) sprayed with compressed oil-free air. The back side and edges of the steel panels with x-cut coatings (according to EN ISO 17872) were protected, and the samples were mounted at the angle of 20° vertically. The temperature in the spray cabinet was maintained at 35°C. The viscosity values of the prepared polyurethane paints are presented in Fig. 2. The compositions filled with aluminum ammonium phosphates (AAP-1 or AAP-2) were significantly more viscous (900 and 820 mPa·s, respectively) in relation to the systems with calcium aluminum ammonium phosphates (650 and 670 mPa·s), strontium phosphate (530 mPa·s), and zinc phosphate (670 mPa·s). It should be noted that the analyzed parameter was not affected by the fillers particles size (Table 2). For example, diameters of AAP-1 (283 nm, 900 mPa·s) and CAAP-1 (298 nm, 650 mPa·s) were quite similar. Nevertheless, viscosity of the paints depended on the oil adsorption number (OA) of the tested phosphate fillers and their content in the coating compositions. The highest OA and the lowest phosphate volumetric content were noted for AAP-1 (160 g/100 g, 5.8 vol.%). Considering the other compositions with nanosized phosphates, these with the strontium phosphate (the lowest OA and the highest volumetric content) reached the lowest viscosity. On the other hand, cured coatings containing the aluminum ammonium phosphates exhibited significantly higher gloss (92 G.U. for P-AA1 and 86 G.U. for P-AA2; Fig. 2) in relation to the systems with the CAAP-type fillers (77 and 81 G.U.) or SP (62 G.U.). However, application of AAP/SP mixtures (weight ratio 50:50, volumetric ratio ca. 60:40) markedly reduced viscosity of the liquid compositions (in comparison with these containing only AAP-1 or AAP-2), and gloss of the prepared coatings was not so significantly diminished (85 G.U. for P-AAS1 and 82 G.U. for P-AAS2). It should be noticed that the former parameter values recorded for the AAP/SP-based paints (i.e., 680 and 650 mPa·s) and the paint filled with microsized zinc phosphate (P-Z, 670 mPa·s, Ø2.8 μm; Table 2) were similar. On the other hand, gloss of the coating with ZP was much lower (65 G.U., Fig. 2) in comparison with P-AAS1 and P-AAS2. Reduced gloss of cured coatings containing a microsized anticorrosive filler (in comparison with samples with nanosized phosphates) was previously observed and described in the literature.7 Due to relatively high gloss values of the samples filled with ammonium-modified phosphates (≥ 77 G.U. ), these systems can be applied as highly decorative protective coatings. Generally, coatings filled with the zinc-free phosphates exhibited markedly higher hardness than the sample with ZP (Fig. 3). These with the aluminum ammonium phosphates (P-AA1, P-AA2) reached 13–14 hardness units after 1 day of curing at RT (10 a.u. was noted for P-Z). After 14 days since application of the AAP-based layers, their hardness was higher (61 a.u.) in relation to the system with zinc phosphate (54 a.u.) and samples with the other phosphates (57–60 a.u.) as well. Due to a relatively high hardness of the coating with strontium phosphate (60 a.u. after 14 days), the samples containing mixtures of that filler with the aluminum ammonium phosphates reached quite high values of that parameter (58 a.u. for P-AAS1 and 60 a.u. for P-AAS2). 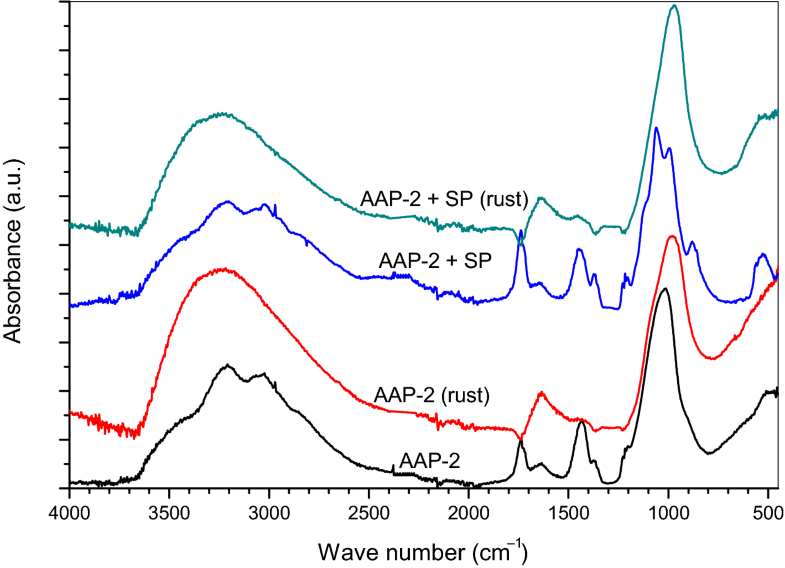 Interestingly, the highest hardness was noted for the samples containing aluminum ammonium phosphates; however, volumetric content of AAP-1 (5.8 vol.%) and AAP-2 (6.4 vol.%) in the coatings was lower in comparison with the CAAP-type (7.2 and 6.9 vol.%), SP (7.7 vol.%), or ZP filler (7.1 vol.%). 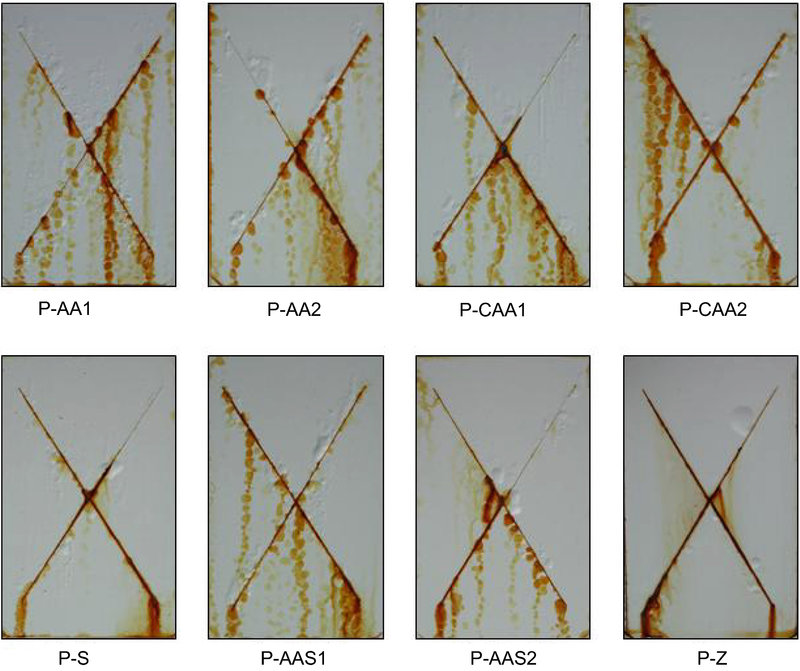 The mentioned coating with AAP-1 filler (P-AA1) was characterized by the higher average pull-off adhesion values (3.6 MPa before and 3.4 MPa after immersion for 250 h in a brine) in comparison with the other samples; it is noteworthy that pure cohesive-type failures were observed for all tested coatings. 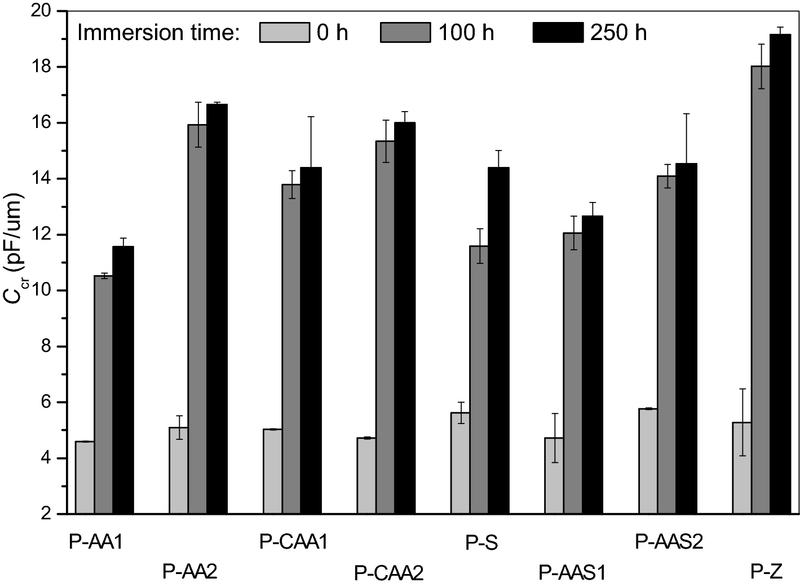 Slightly lower adhesion/cohesion was recorded for P-CAA2 (3.4 and 3.0 MPa, respectively). 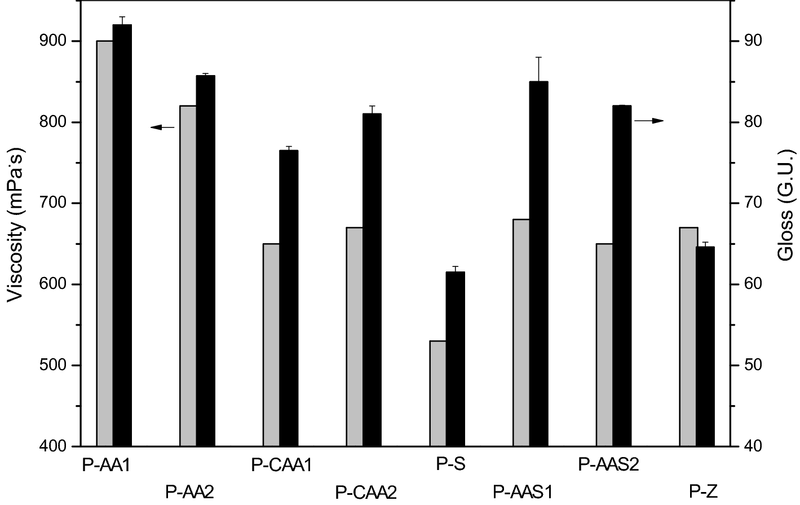 In the case of samples with the aluminum ammonium phosphates (or with the calcium aluminum ammonium phosphates), higher cohesion of P-AA1 (or P-CAA2)—before its immersion in the brine—was probably a result of the lower volumetric content of AAP-1 (CAAP-2) than AAP-2 (CAAP-1; Table 1) in the coatings; dissipated nanoparticles of the phosphates might act as steric hindrances disturbing/limiting crosslinking process of the polymeric matrix (mainly in the samples with a higher nanofiller content, i.e., in P-AA2 and P-CAA1). After immersion in the NaCl aqueous solution (250 h), average cohesion values for P-AA2 and P-CAA1 (as well as for the other coatings) were slightly increased, e.g., from 2.7 to 3.1 MPa for the former sample. Perhaps it was caused by a reaction between the partially unreacted isocyanate curing agent and water penetrating into the coatings (and creation of urea linkages). 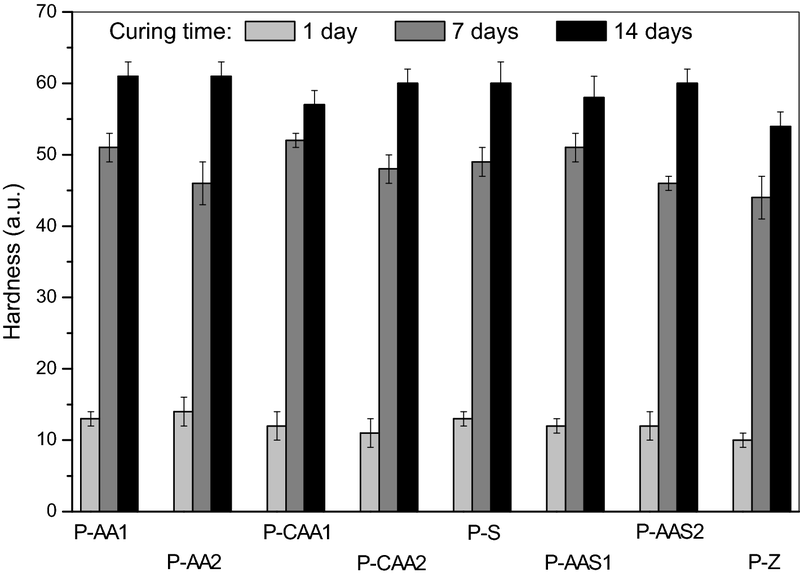 It should be mentioned that pull-off adhesion of the coating systems (exhibiting the highest initial values of that parameter: P-AA1 and P-CAA2) was reduced after their immersion in the brine. In these cases, the water molecules penetrating the samples were not consumed via their reaction with –NCO groups, but they plasticized the polymeric binder of the layers and/or weakened hydrogen bonds between polymer chains. It is noteworthy that the polyurethane coating modified with the microsized zinc phosphate exhibited significantly lower adhesion (2.1 and 2.5 MPa) in relation to the other systems (Fig. 4). In the case of fillers exhibiting similar water solubility, a coarse-grained phosphate filler (e.g., AAP-2, 334 nm; Table 2) should create a spherical capacitor with a higher capacitance value (Ccr = 16.7 pF/μ for P-AA2) than a fine-grained filler (AAP-1; 283 nm, 11.6 pF/μm). 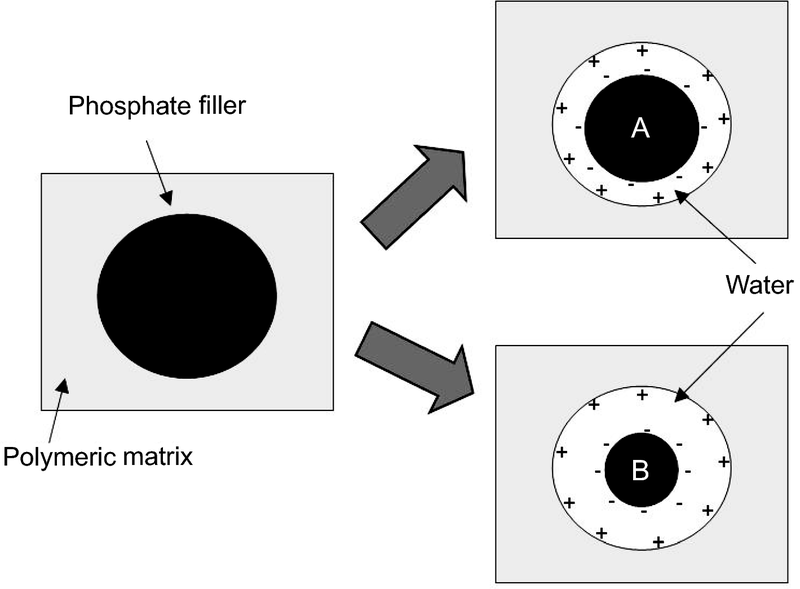 Considering phosphate fillers with similar particles diameters, higher capacitance should be observed for the sample with a low-solubility phosphate (e.g., P-CAA2; 310 nm, water solubility: 0.55 wt%, Ccr = 16.0 pF/μm) than for the system with a more hydrophilic phosphate (P-CAA1, 298 nm, 0.72 wt%, 14.4 pF/μm). Arguably, electrical permittivity of a capacitor spacer (ε) (i.e., water or a filler aqueous solution) significantly influenced the registered capacitance values. EIS data (Rpr and Ccr) do not correlate with the salt spray test results (Table 3; Fig. 9). The lowest delamination around the scribe (after 480, 960, and 1440 h of coated samples exposition) was registered for the coatings filled with AAP-2/SP mixture (P-AAS2; 4.4–6.4 mm) and CAAP-2 (P-CAA2; 4.9–7.1 mm); the highest values of that parameter (1440 h) were noted for P-AA1 (10.5 mm) and P-CAA1 (11.0 mm). It should be noted that the samples (P-AA1 and P-CAA1) were also markedly blistered outside the scribe after exposure in the salt fog chamber (Table 3). Interestingly, P-AA1 exhibited the best barrier features according to EIS data, i.e., the highest Rpr (604–29.6 MΩ/μm; Fig. 5) and the lowest Ccr values (4.6–11.6 pF/μm; Fig. 6) in relation to the other systems (431–0.12 MΩ/μm and 4.7–19.2 pF/μm). It is noteworthy that the lowest Rpr and the highest Ccr values (250 h) were revealed for the sample with zinc phosphate; that coating reached moderate delamination around the scribe during exposure in the salt spray cabinet (5.8–8.4 mm; Table 3). 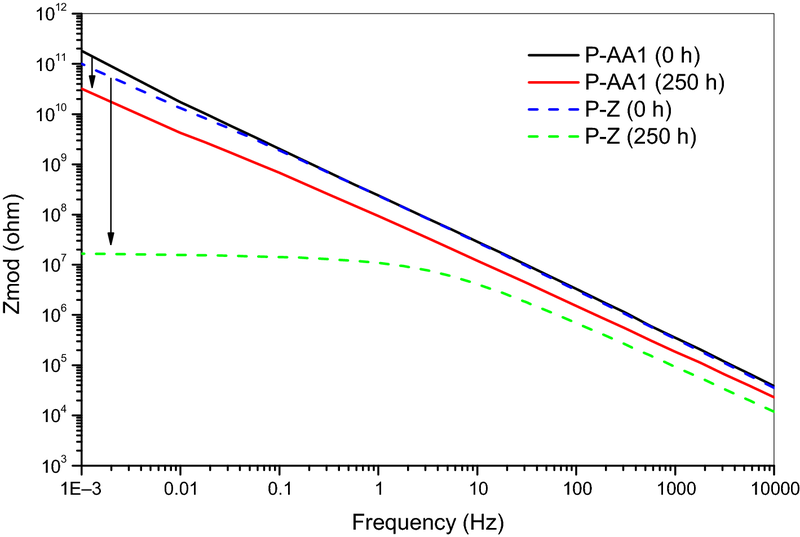 That microsized filler was also characterized by the medium values of current noise density (292 nA/cm2) and corrosion inhibition efficiency (85%) calculated by means of electrochemical noise data (Table 4; Fig. 10); better anticorrosive features were noted for SP (146 nA/cm2, 92%), CAAP-1 (190 nA/cm2, 89%), and CAAP-2 filler (246 nA/cm2, 86%). As mentioned above, the coatings filled with CAAP-2, i.e., P-CAA2, (or with the mixture of AAP-2 and SP; P-AAS2) exhibited the best anticorrosive features during their investigation in the salt spray chamber. It is noteworthy that delamination around the scribe was lower for the sample with CAAP-2 (or AAP-2) than for the coating based on CAAP-1 (AAP-1); probably it was a result of higher pH values of aqueous extracts of CAAP-2 and AAP-2 (caused by a higher NH3 content in these fillers; Table 2). In the case of the coatings with mixed phosphates (P-AAS2; pH 7.8 for AAP-2 and pH 7.6 for SP), a synergistic effect occurred. 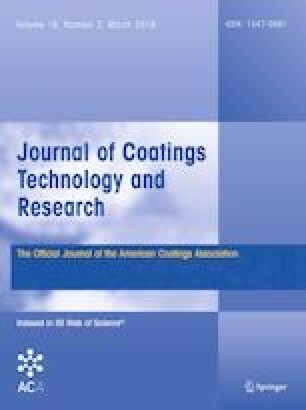 Higher protective efficiency of epoxy coatings filled with strontium aluminum polyphosphates (in relation to zinc phosphate-based coatings) was revealed in the literature21; probably it was caused by precipitation of a protective layer (containing Fe, Sr, and P) on a steel substrate. The paints with the ammonium-modified phosphates exhibited similar (CAAP, AAP/SP) or slightly higher viscosity (AAP) than the composition based on ZP. The lowest viscosity was noted for the paint filled with SP. Cured coatings with the nanofillers (mainly AAP-type) reached markedly higher gloss and adhesion as well as slightly higher hardness in relation to the system filled with ZP. The primer-less coatings containing AAP/SP, SP or a selected CAAP filler exhibited reduced delamination around the scribe (6.4–7.9 mm after 1440 h in a salt spray chamber) in relation to the coatings with ZP (8.4 mm); the best protective features were registered for the AAP/SP-filled sample. 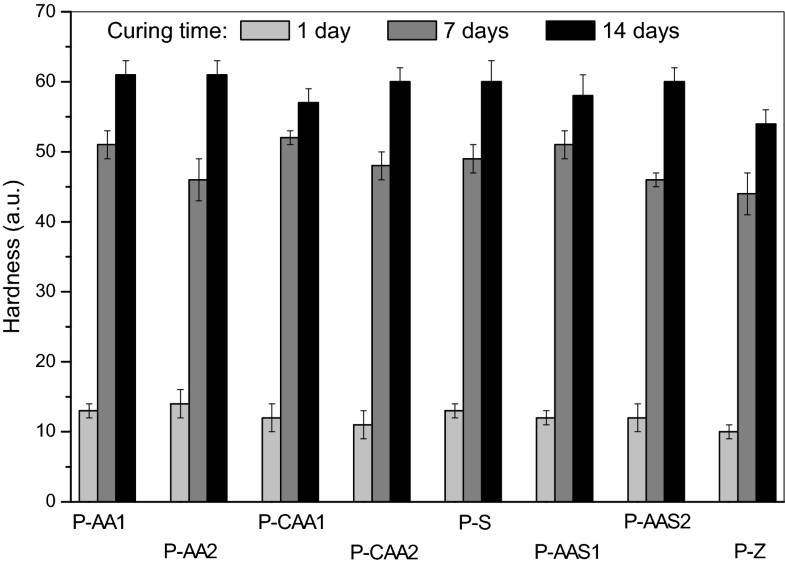 EIS test results revealed markedly higher barrier properties of cured coatings based on a selected AAP filler in comparison with the samples with the other phosphates. These features were affected by phosphate particles size, their water solubility and volumetric content in a coating. The highest steel corrosion inhibition efficiency values were registered for aqueous extracts of the AAP fillers and a selected AAP/SP mixture (results for potentiodynamic polarization tests) and for aqueous suspensions of SP and the CAAP-type phosphates (electrochemical noise experiments). The results of the electrochemical measurements did not correlate with the salt spray chamber test outcomes; however, these experiments confirmed a better barrier/anticorrosive efficiency of the nanosized zinc-free phosphate (and related coatings) in comparison with the system based on the microsized zinc phosphate. Work financed by the National Centre for Research and Development (NCBiR, Poland) under the “Tango” Project (TANGO1/266477/NCBR/2015; 2015-2018). Some of the results were presented at “Antykorozja” scientific conference (29-31.03.2017, Ustroń-Jaszowiec, Poland).